This video segment adapted from NOVA scienceNOW tells the story behind one of the most significant scientific breakthroughs in the past decade. Human embryonic stem cells, once thought to be the key to curing countless debilitating diseases, have sparked a decade-long firestorm of ethical and political debate in the United States that has greatly curtailed their use in scientific research and medical therapies. Now a revolutionary method of creating stem cells—without embryos—may pave the way to swifter progress in the effort to understand and cure diseases. Log in to Teachers' Domain to download, share, rate, save, and match to state standards. This media asset was adapted from NOVA scienceNOW. Unlike most of the other cell types in the human body, stem cells are "pluripotent," meaning they have the capacity to become any of the 220 specialized cell types in our bodies, given the right set of genetic cues. Many experts think that harnessing this potential is the key to curing dozens of diseases. From stem cells, scientists hope to create populations of diseased brain cells that can be studied to better understand how diseases like Huntington's or Alzheimer's disease develop, and to create healthy cells of many types to replace patients' diseased cells and tissues. But stem cells are difficult to come by. Before 2007, embryos gathered from in vitro fertilization (IVF) clinics were the only viable source of human stem cells. Many people consider their collection, which destroys the embryo, morally wrong, and in 1995, the U.S. government prohibited federal funding of such research. In addition, creating patient-specific stem cells was once thought to require cloning, a process that is also morally and politically fraught. In this process, the DNA from a patient's cell is placed into a human egg cell from which the DNA has been removed. The stem cells that result when the egg develops contain genetic material identical to the patient's. These cells could, hypothetically, be used to replace diseased cells in that individual if human cloning were not so controversial. Ironically, it was an observation of the cloning process that initially led Japanese scientist Shinya Yamanaka to a revolutionary method of creating stem cells that could obviate the need for both embryos and cloning in stem cell research. Yamanaka knew that, in cloning, the insertion of DNA from a specialized adult cell, such as a skin cell, into an egg cell causes the specialized cell's DNA to be reprogrammed. 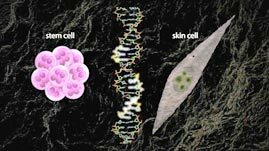 The skin cell's genes are turned off and stem cell genes are turned on. Although exactly what causes this transformation remains unknown, Yamanaka went off in search of a set of stem cell control genes—a small set, he hoped—that could be used to reprogram cells through means other than cloning. Yamanaka narrowed the list of possible genes from 100 to 4 using a painstaking process of elimination and so-called "knockout" mice. Knockouts are genetically programmed so that one gene is nonfunctional. By observing the physiological effects of the genetic difference in a group of knockout mice, scientists can deduce what role that gene might play in organisms with a functional gene. Once Yamanaka had identified a set of genes that seemed to be involved in stem cell programming, he set out to test his candidates by inserting them into the skin cells of mice. To do this, he used viruses in a technique that is now standard practice in genetics labs. Viruses have evolved a way of packaging and inserting genes into host cells. Often this causes disease, but scientists have found a way to engineer viruses to carry genes of other animals, including mice and humans. The viruses Yamanaka used had been engineered to carry the four genes that he thought were involved in stem cell programming. Indeed, when the viruses had done their work on a population of skin cells, the transformation from specialized skin cell to pluripotent stem cells was quick—and the path toward stem cell treatments and cures suddenly became clearer. To learn more about the science and controversy behind stem cell research, check out Stem Cells: Seeds of Hope? and Stem Cell Debate. To learn more about how cells differentiate, check out Cell Differentiation. Explore in this NOVA scienceNOW classroom activity how stem cells become specialized cells. What property of stem cells makes them interesting to scientists? How do you think stem cells could be used to treat diseases? What do you think the NOVA scienceNOW correspondent meant when he described taking an ordinary skin cell and turning back its genetic clock? Describe some of the ways that this scientist relied on previous discoveries and techniques to make his breakthrough. © 2008, WGBH Educational Foundation. All Rights Reserved. George Daley of Children's Hospital Boston answers questions about stem cell research. Should we create human embryonic stem cells through cloning? A fraudulent South Korean researcher is unmasked, and scientists find a new technique for easing ethical concerns. NOVA scienceNOW’s first story on stem cells covered the hopes and controversies of stem cell research in 2005. Microphotographs show step-by-step how scientists create a cloned mouse embryo to generate embryonic stem cells. Unfertilized egg cells that spontaneously develop into blastocysts offer an approach to stem cell research. Why is Whooping Cough Back? Each state sets its own policies for vaccination requirements and exemptions, and they vary widely across the U.S.
What are human papilloma viruses, why do they cause cervical cancer, and how well does the HPV vaccine work? How do epidemiologists figure out the role of low vaccination rates in preventable diseases like measles or pertussis? When enough people are immune to a disease, the "herd" protects those who cannot safely receive a vaccine. NOVA has stood for science since 1974, bringing remarkable discoveries to TV and beyond. Here's everything you didn't want to know about snot. Science is facing what many consider a reproducibility crisis, and the stakes are high. Join the scientists who saw Zika coming as they trace the origins of this devastating virus. Alt School, located in Palo Alto, California, is an experiment in customized learning environments. See exactly how your heart pumps blood throughout your body and learn astounding facts about the human heart. Toxic compounds in animal venom could yield new drugs for heart disease, cancer, and chronic pain. Hear Steven Pinker, Rodney Brooks, and other experts offer their insights on what it means to be smart. Humans haven't found a way to counteract or block the effects of aging, but we've tried. See how in this time line. In the year 2000, the U.N. set out to make maternal health care a universal right. Where does that goal stand today? Cell biologist Mark Roth says that suspended animation isn't just science fiction. Bioethicist Art Caplan says that memory-altering drugs raise major ethical questions. Can music help diminish the crippling symptoms of Alzheimer's disease? A new study at Harvard is exploring how emotions affect our decisions, whether we like it or not. National corporate funding for NOVA is provided by The Boeing Company. Major funding for NOVA is provided by David H. Koch, the Corporation for Public Broadcasting, and PBS viewers.